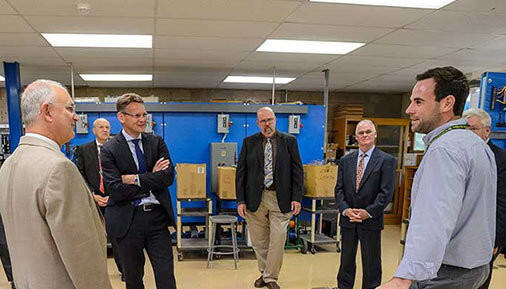 Faculty member Jason Bloomingdale, right, discusses coursework in the college's Electrical Construction and Maintenance program with National Grid CEO John Pettigrew, center, and other National Grid executives. National Grid CEO John Pettigrew visited the Hudson Valley Community College campus on Wednesday, Aug. 30 to take a look at several workforce initiatives the international energy provider has created in partnership with the college. Pettigrew joined the UK-based National Grid in 1991 and has worked in electricity and gas distribution around the world for 25 years. He became National Grid's chief executive officer in 2016. On Wednesday morning, Pettigrew toured the campus with President Drew Matonak, Dean Phil White and several National Grid executives. He visited the overhead lineworker lab in Williams Hall as well as the solar array, which is used to train students in the Electrical Construction and Maintenance and PV Installation programs. Pettigrew also dropped in on several other technology classrooms and labs in Williams Hall. The college's Overhead Electric Lineworker certificate was developed a decade ago in conjunction with the international energy provider when they saw a growing number of lineworkers nearing retirement. Hudson Valley now graduates more than a dozen lineworkers each year, many of whom find work at National Grid. This summer, Hudson Valley's Workforce Development Institute launched a 90-hour Natural Gas Technician certificate program in conjunction with National Grid. The non-credit course teaches students the entry-level skills used in gas construction, maintenance and customer service. Those who successfully complete the training will be prepared for career opportunities in the growing natural gas industry. The program had more than 100 applicants for 12 spots in the training program, which is set to start this fall.